The Alec family features a simple stripped down design in a sophisticated profile. Far from basic, this family's slender frame is finished with a warm antique silver finish and gracefully supports each richly detailed Mica shade. 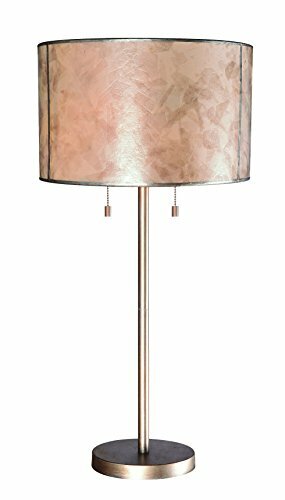 Standing at a towering 61-inches in height, the Alec floor lamp is topped with a 14-inch dazzling Mica shade. The rich highlights of the shade take flight when illuminated - two bulbs operated by dual chain switches cast an even glow over the surface of the shade. Expertly suited for a living room or bedside night stand, the Alec table lamp rests at a comfortable 29-inches in height. Each lamp in the Alec collection is outfitted with a well proportioned disc-shaped weighted base to prevent accidental tip overs from clumsy guests attempting to get a close look Alec's remarkable shade.